Editor’s note: This is the second of a two part series with Rob Behr of Western Powders. Rob provides some tips on reloading that I think you’ll find invaluable. 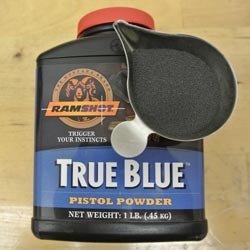 True Blue has a wide range of applications and is one of Rob’s favorite powders. Q: I note that the burn rates of #5 and True Blue are nearly identical. When would you use it vs. #5? A: True Blue is an unusual powder and one of my favorites. It is the consistency of very fine sand. It is a straight-up powder grain with no deterrents. It burns cleanly because there is nothing else there. True Blue packs very efficiently inside a case which is both good and bad. In high intensity loadings with limited capacity (We’re looking at you, Georg Luger) it makes a hell of a load. In lower pressure cases with huge capacity, 45 Colt leaps to mind, it develops positional issues. Q: From my understanding Western is putting #2 back into production. What qualities does this particular powder have? A: Accurate #2 is a lower density spherical propellant which is a rare duck. Because it is more time consuming to make, our manufacturers were unwilling to open up production slots that could be used for simpler and faster to make products. Now that there is more surplus production, we are finally seeing #2 return to the vendor’s shelves. Accurate #2 is at its best in large cases where case fill is an issue. The .38 Special and .45 Colt are two very good examples. It is also a very good powder for reduced loads in the truly big magnum cases like the .500 Smith and Wesson. We get that call quite a lot. Guys pick up the biggest, loudest pistols and then realize the laws of physics are still in effect and that shooting what amounts to a buffalo rifle in a handgun hurts. Accurate #2 can take away some of that sting. 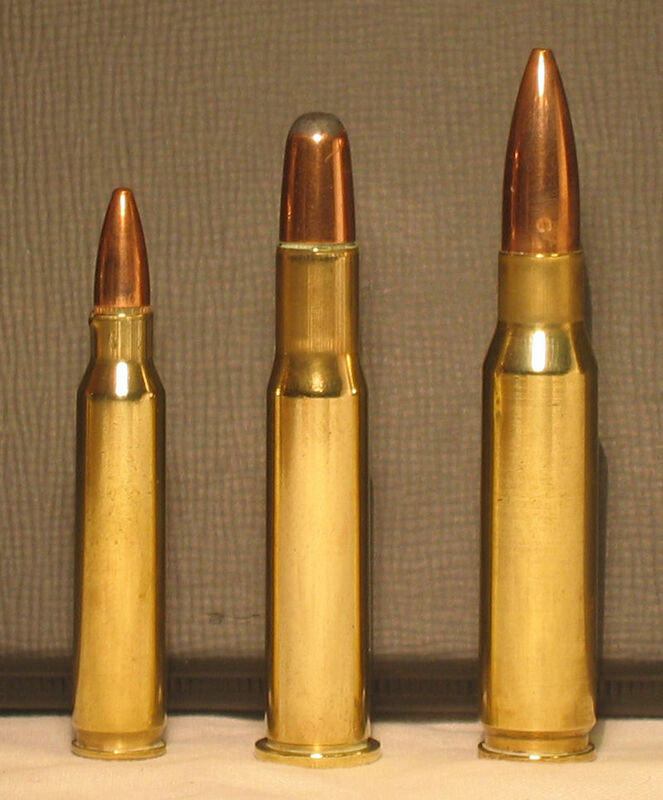 The 30-30 round (middle) is flanked by the 5.56×45 NATO and the .308 Winchester. It’s fun to shoot light loads in a Winchester carbine. Q: Here’s an esoteric question: I’ve used Alliant’s 2400 for shooting cast bullets in my 30-30, will #5 or #7 work? If so, what kind of load do you suggest for a 172 gr. bullet? A: I’ve never heard of this Alliant Company. What do they sell? Honestly, I always try to steer people away from that route, but they rarely listen. Handloaders are by nature a defiant lot. We have an unusual powder that offers a much better answer for cast bullets in rifle cartridges. Accurate 5744 is a double-base extruded powder that has high ignition characteristics, low density and reduced positional sensitivity. I’ve included data for your .30-30 so you can see its performance range. (It is a much safer option than using pistol powder in a rifle cartridge for reduced loads). Maximum load: 26.3 grains (ca 2400 Fps). Maximum load: 23.0 grains (ca 2300 Fps). Maximum load: 21.5 grains (ca 2100 Fps). Maximum load: 22.0 grains (ca 2075 Fps). Maximum load: 20.0 grains (ca 1893 Fps). 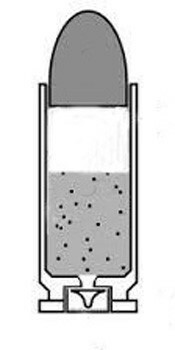 Q: Please explain the significance how the position of powder in the cartridge impacts the load? Charges that only partially fill a case develop different pressures depending on the powders orientation. Powder oriented toward the bullet produces the least pressure, while powder toward the back, against the primer creates the highest pressure. The extreme spread can be pretty dramatic. You can get a .38 Special load that is going 750 fps to drop below 500 fps with load of dense powder if it has room to migrate. Shooters can see this for themselves with a chronograph. The shooter can orient the muzzle down and give the pistol a couple of shakes. Once the powder has been given a chance to migrate, the shooter slowly raises the pistol and then shoots across a chronograph. The experiment continues by aiming the pistol in the air, again shaking it and then slowly lowering it for another shot over the chrono. The velocity shift shows the effect of powder position on velocity. This problem isn’t limited to pistols. Shooters that elect to use pistol powders to make reduced loads for their rifles see a variation on this theme: the dreaded ringed chamber. In this this case the wad or buffer gets the blame. 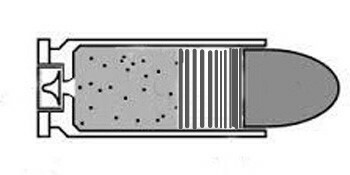 A shooter develops an unbuffered load using something like Blue Dot, which is very fast and has a lot of room to migrate in a rifle case. Because of the nature of shooting safety, where the muzzle is kept down until the shot is fired, and the fact that most rifles tend to be shot relatively parallel to the ground, most loads tend toward a powder forward position. Now with their fully developed load in hand, the shooter elects to use a wad to prevent powder migration, forcing it against the primer and into the maximum pressure position. 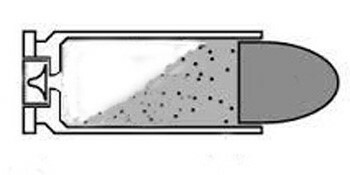 Buffering forces powder to the highest pressure position. I’ve had otherwise sane people suggest that the dacron wadding, at the moment the shot was fired, turned into a hardened plastic projectile that then struck the back of the bullet hard enough to expand it and cause a chamber ring. Nope. That is just silly. What happened was a hand loader made a dangerous choice, using pistol powder in a rifle case, and compounded it by breaking the cardinal rule of hand loading. If you change a component, go back to the start and work it up again. Instead, they elected to not develop their load with wadding place and created overpressure because they forced the powder into its maximum pressure position. Just a trigger pull and 200 microseconds later their rifle was ruined. Q: Would competitors say an IDPA or IPSC or Bullseye be choosing different powders from someone who is simply plinking at the range? Would you recommend the same products as in the previous question? I would recommend the same powders. I know that the temptation is to go with fast powders because they offer lower charges and a slight reduction in loading costs, but in the end it seems like false economy. Automatics run more smoothly with slower powders, not to mention the velocity or pressure advantages. When it comes to cost, powder is one of the cheaper components. The pistol is the most expensive one, and it is at risk from potential double charges of extremely fast powders. It is better to get good case fills whether you are plinking or competing in a shooting event. Q: What are some of the most frequent questions you get from beginners? 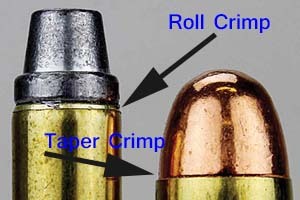 Crimping and belling are tough issues for beginners because they are so subjective. A: Beginners are usually careful and cautious. The most common questions we get are usually about component compatibility… “Can I use the data for this 185 grain bullet for the one I’ve got?” type questions. Their main concern is to avoid blowing up (or off) things they are fond of. I admire that. I also think this is why I see so few accidents from beginning hand loaders. Their crimps may be bad, or they have a permanently stuck case in a full length sizing die, but they rarely blow things up. That is left to the much more dangerous guy who has been hand loading for 30 years. Crimping and belling are tough issues for beginners because they are so subjective. Both of tasks are based on experience; on being able to feel and see when they are right. It takes time to develop those skills. Luckily, beyond modest functionality issues, there is a great latitude in how these tasks are done before real problems occur. (See our blog “What went wrong” which has some good tips on crimping). Hand loading is like golf: The results get better over time, but the hand loader never stops perfecting their skills. Rob Kay writes about firearms for Hawaii Reporter and is the author of How to Buy an AK-47. Next articleTesting for Prostate Cancer – Yes or No? Rob Kay is a Honolulu-based freelance writer and publicist. He is the author of two Lonely Planet guide books, www.fijiguide.com (a popular South Pacific travel site) and an AK-47 buyer's guide.